Do you have missing teeth due to disease or an accident? Are your teeth (or lack of them) getting you down? Are you embarrassed by gaps or missing teeth? Does your smile impact on your social life? Don’t worry, if you need dental implants, we can help you restore those missing teeth to how they once were and put the confidence back into your smile. 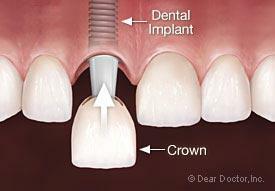 Dental implants are artificial roots that act like natural teeth, so you won’t even notice the difference. They can be used to replace just one missing tooth by supporting a crown, multiple missing teeth by acting as the support structure for a bridge of several crowns, or can hold loose dentures securely in place. Dental implants maintain the natural bone in your jaw, preventing further bone loss and that sunken jaw look. Implants are inserted into the jaw in a quick and painless procedure unlike conventional dental bridges, which require adjacent teeth to be drilled for support. Because implants are anchored into jawbone, they offer unparalleled stability and comfort similar to that of your own natural teeth. With proper care and correct oral hygiene, dental implants are a long term solution to giving you the perfect smile and restoring your confidence. Where and how implants are placed requires a detailed assessment including x-rays and scans..
What are the options for implant tooth replacement?. No. But aftercare is important if you are going to have a long-lasting, successful implant. Your dental team should give you detailed advice on how to look after your implants. Cleaning around the teeth attached to the implants is no more difficult than cleaning natural teeth. However, there may be areas that are difficult to reach and you’ll be shown how to clean them. You may need to visit your hygienist more often but our dental team will be able to talk to you about this at your consultation.